The mysterious "worm lizard" has finally found its evolutionary home; the legless animals are closely related to a group of lizards named the lacertids, a new fossil intermediate indicates. The worm lizards, also called amphisbaenians, look so similar to primitive snakes that researchers weren't clear which group they belonged to, the snake or lizard family. "They look like, basically, worms, or a group of snakes that we call blind snakes," said study researcher Robert Reisz, of the University of Toronto, Mississagua, in Canada. "They burrow for a living and eat grubs." This new fossil, named Cryptolacerta hassiaca, has an amphisbaenian-like reinforced head but retains chunky, lacertid-like limbs. 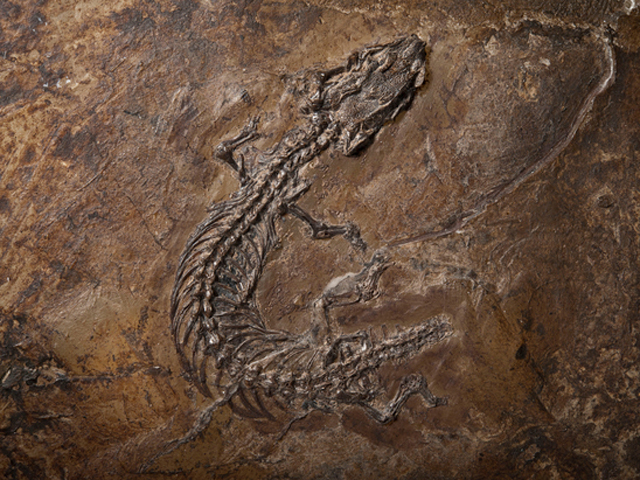 The fossil was discovered in the so-called Eocene Messel site near Frankfurt, Germany, and provides the first skeletal evidence that the two groups are most likely related. "These animals first evolved a shovel-like head, burrowed headfirst with a shovel-like mechanism, then after that lost its limbs," Reisz told LiveScience. "There are lots of things about the head that tell us it was well on its way to be a amphisbaenian." The 47-million-year-old fossil is well preserved and represents the only known example of its species. At the time of its death it would have been considered a "living fossil," having survived unchanged from its ancestors for millions of years. There are other, older fossil examples of the amphisbaenians, but this is the first example of the intermediate stage between the lacertids and the amphisbaenians. The fossil organism most likely lived in the leaf litter on the forest floor. It used its reinforced head to dig in the dirt and leaves, though it most likely didn't live completely underground. Throughout evolution, animals have lost their limbs several times, so it's not unfathomable that these two species developed similar body plans and burrowing strategies separately, the researchers say. "We have two groups of animals — the blind snakes and these limbless lizards — resembling each other to a great degree, but they developed this body design independent of each other," Reisz said. "There are lots of ways you can lose your limbs, and this one gives us an example of how it happens in these strange little subtropical lizards." The study was published today (May 18) in the journal Nature.